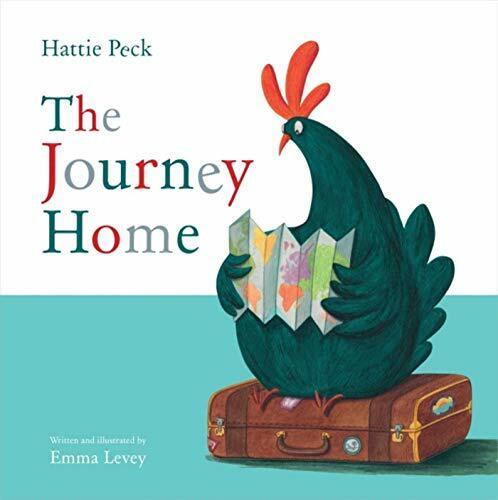 Readers familiar with the first Hattie Peck story will welcome the follow-up in Hattie Peck: The Journey Home. Emma Levey has continued the story of this admirable hen and her insatiable desire to adopt and raise every abandoned egg. Hattie is a mom with a huge heart, an all inclusive personality, and a noble conviction. She has bravely rescued a multitude of eggs—whether avian, reptilian, or other—from the far reaches of the world. She has patiently waited for them to hatch and was thrilled to count each and every hatchling as a critical member of her chosen family. She has lavished them with a sense of belonging. Alas, there comes a time in the raising of young ones when they must go out into the world. Hattie does not shirk this shift as she prepares to launch into her empty nest phase. Her approach to preparation is practical and typical. She makes the necessary adjustments to her sturdy boat, packs a suitcase and fixes snacks. And off they go, all together, into the next adventure of life. Each critter returns to their place, be it a city, a town, a mountaintop, a cave. Then Hattie does the only thing left to do: she goes home . . . alone. The love and acceptance Hattie has diligently and unwaveringly shown her brood returns to her when everyone comes back for a surprise visit and wraps their mom in an equally unconditional embrace. The story of adoption is crystal clear and is given a positive and purposeful perspective. Families with this structure will most likely resonate with this sentiment while families with a more traditional structure will gain insight into why, while being drastically different family structures, each family is equally special. As a second book in a series, there are some plot points that seem random without the context of the first. When Hattie takes her hatchlings back out into the world, one wonders why it is necessary to be so dramatic and diverse. There is no connection between rooftops, chimneys, gutters, cities, mountains, ledges, caves, and bad weather to the rest of the story. One must assume that these are the locations from which Hattie previously rescued the eggs and she would, therefore, naturally return them from whence they came. It would not have been difficult to add a subtle reference to clarify the motive for all of these locations making a well-conceived concept a more solid product. Levey’s illustrations, needless to say, are precious. Her characters each have their own personalities as quirky, wild, restless, rambunctious, spunky, curious—there being so many busting forth from this remarkable family with no two alike. Particularly captivating and humorous is the clever illustration depicting family photos from special outings, Christmas time, and a birthday celebration. The book carries a seamless, thoughtful, and consistent design with the text typography matched well to the mood and playfulness of the story. Levey has certainly delivered a very readable and enjoyable picture book.